I created this resource since I found that a lot of the students that I worked with that had Autism and other special needs had difficulty making the connection between real objects or events and line drawings or symbols. This is an activity that targets our student’s ability to answer when questions. 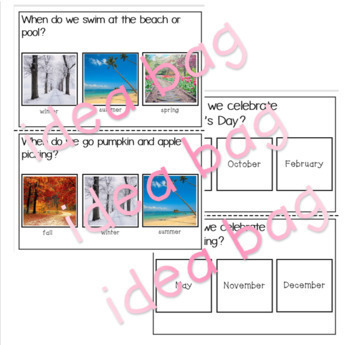 The questions are related to some activities and holidays. The response choices include the time of the day (i.e. morning, afternoon, night), month (i.e. January, April), holiday (i.e. Thanksgiving, New Year), and season (i.e. winter, spring). Real pictures or photographs are used. There are 32 pages with 2 cards on each page for a total of 64 cards. You can print the pages, cut them, and laminate. Students can then use dry erase markers on the cards to mark their answers. 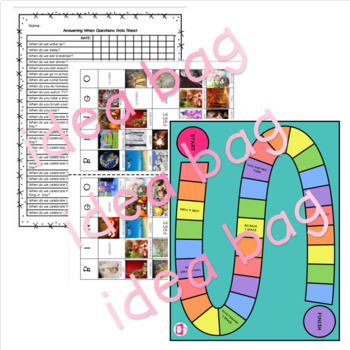 Besides the photo cards, this packet also includes a data sheet to keep track of your student’s progress and a board game with the question cards. 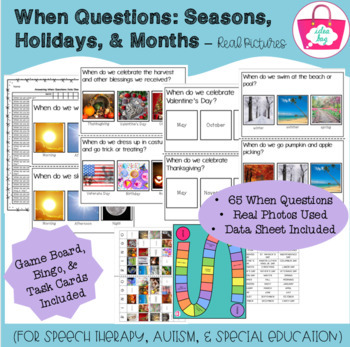 You can have your students use the game board and answer the question cards when they no longer need a visual prompt. There are also 4 Bingo Cards to further reinforce the skill. I hope you find this product helpful! I would greatly appreciate it if you would rate the product and leave feedback. Remember that each feedback that you give earns you tpt credits. 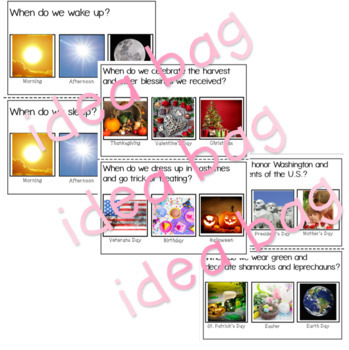 Please feel free to e-mail me with any questions or concerns about the product at ideabagtpt@gmail.com. I am easy to work with! Thank you! To earn credits: After you make a purchase, you'll need to leave feedback on your purchase. We recommend waiting to do so until you've had a chance to use the product. When you're ready to leave feedback, just return to "My Purchases" and click the "Provide Feedback" link to the right of the date purchased.